Television has been a key player in fueling the popularity of celebrity chefs. Before the information generation of today was exposed to a steady stream of cable TV food celebrities, a few pioneers put the culinary craft on display for public television viewers. Julia Child was one of these early pioneers. In fact, she played such a key role in food television that the Smithsonian Institution received permission to relocate her original kitchen to an American History exhibit. Child’s characteristic voice and affect was so unique that it has been parodied many times. Her passion for cooking was undeniable and made her an endearing personality to anyone who ever picked up a spatula. Her delivery at times was hilariously funny, so even her most pedestrian demonstrations made for good television. Chef Child’s boiled down French gourmet cooking was available in most American households in the early 1960s, when she became standard public television fare with her now famous program, The French Chef. 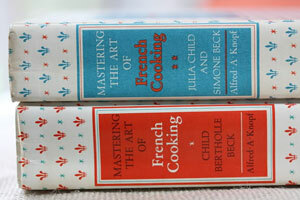 Child’s first cookbook, Mastering the Art of French Cooking, opened American’s eyes to what had previously been an intimidating area of cooking. The book brought accessibility to French cuisine that had not been put forth in previous publications on the subject. Once Child began illustrating her techniques on TV, she became the go-to resource for anyone who wanted to expand his or her culinary horizons. To a student chef, Child’s onscreen exploits can be an education in themselves. Her techniques are fundamentally sound and they provide the foundation on which many modern culinary innovations are built. Many episodes of The French Chef can be viewed online for nothing, so students should not overlook Julia Child’s iconic culinary message. Julia’s path toward notoriety in the realm of French cooking was actually a serendipitous extension of her marriage to Paul Child. The couple moved to Paris in 1948 when Paul was assigned to a job with The United States Information Agency. In Paris, Child’s palate was truly awakened by French cuisine, which prompted her to enroll at Le Cordon Bleu. There she learned a solid foundation in classic French cooking and the fundamentals of preparing the most famous French dishes. Once Child’s culinary fire was lit, it was not long before she was consulting on a cookbook and teaching French cooking from her home. Working with fellow food enthusiasts whom she had met in a culinary appreciation club, Child’s humble beginnings were born of simple intimate home-based classes. By translating French recipes to English, Child made the French culinary world accessible to Americans who could easily follow her instructions. If you watch Chef Child’s programs, Cooking with Master Chefs, In Julia Child’s Kitchen with Master Chefs and Julia Child and Jacques Pepin Cooking at Home, it is easy to see that her culinary education remained a work in progress throughout her life. By sharing her passion for food with other chefs and remaining open to the organic cross-pollination that occurred during countless collaborations, Child continued her own chef's education right in front of viewers’ eyes. Child’s first book with her collaborators was an overnight success. Mastering the Art of French Cooking was a best-seller that was lauded for bringing French cuisine to a level that could be understood by cooking enthusiasts. The well-illustrated book provided detailed explanations of French techniques and recipes. It was the first of many literary successes for Child. Over the course of her career, Child lent her name to more than a dozen cookbooks. Many of her books expanded on themes taken form her television shows. She was also a frequent guest columnist for the print media. Her first book, however, is the one that remains a groundbreaking fixture in the culinary stables of modern chefs and culinary instructors. Promoting her book on television, her unique demeanor was immediately embraced by an enthusiastic public. When an omelet making demonstration on a Boston television show generated an enthusiastic response from viewers, she was invited back to tape a series of cooking shows. Her initial entry into television was received much like her book; people couldn’t get enough. The French Chef was quickly syndicated to dozens of United States TV stations and Julia’s easy way with French cuisine found its way into the homes of fascinated viewers. Within 5 years of her first TV appearance, Julia Child earned an Emmy for her outstanding show. Throughout the eighties and nineties, Child put forth volumes of TV time packaged as shows like, Julia Child and Company, Dinner at Julia’s, In Julia’s Kitchen with Master Chefs, Baking with Julia, and Julia’s Casual Dinners. Child was committed to promoting food awareness, encouraging new chefs, and promoting educational opportunities in the culinary arts. To these ends she helped found and launch the American Institute of Wine and Food in California in concert with Robert Mondavi and Richard Graff. Today this non-profit organization supports community events and provides scholarships to budding culinary students. The institute’s Day of Taste is a signature event that focuses on bringing chefs together with fourth and fifth grade students for the purpose of instilling a passion for food, and an understanding of how food is produced. Taste and Health is a theme that is actively promoted by the institute through printed materials and engagement with children. Julia child died in 2004. At the time of her death, the unintended culinary empire that had built up around her was responsible for a dozen long-running television programs, untold cooking specials, nearly twenty cookbooks, and an iconic culinary status that mobilized the love and affection of an untold number of fans. Her legacy lives on in many forms, but the American Institute of Wine and Food actively advocates her most valuable culinary points of view. Stressing childhood education and taking the mystery out of cooking was Julia Child's passion in life, and continues as her legacy today.